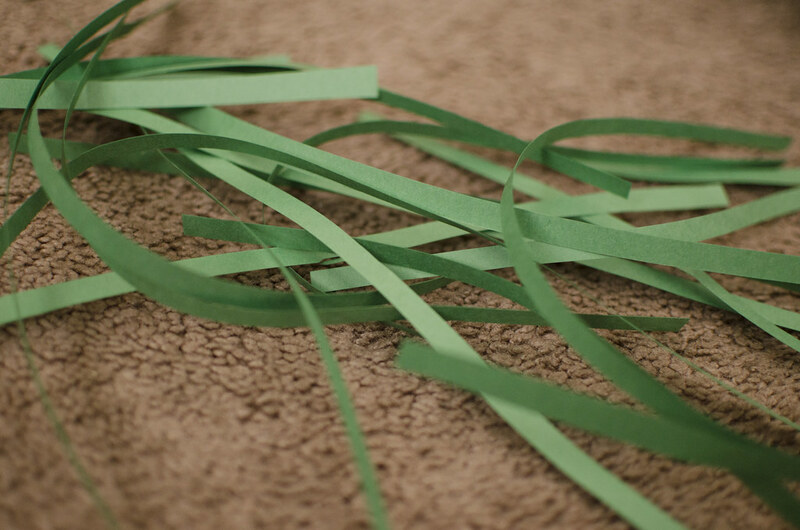 Celebrating St. Brigid’s Day from Kelli Ann Wilson on Vimeo. Allez-vous nous donner d’la fleur? 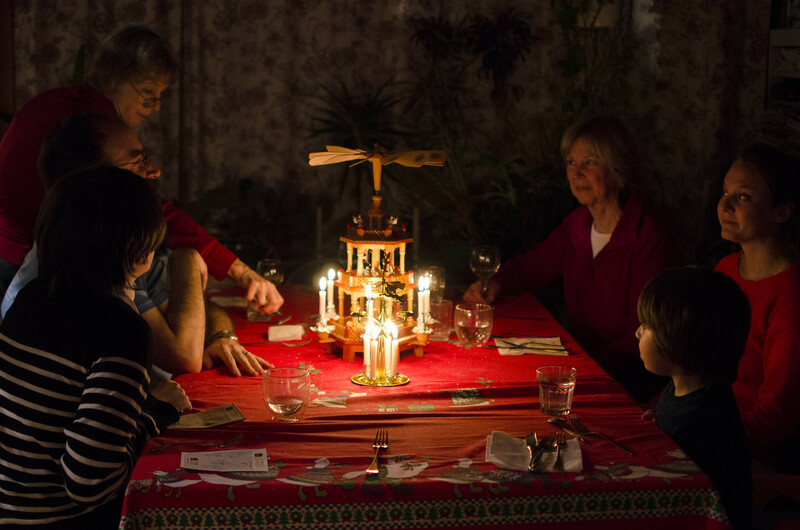 I invite you to celebrate Candlemas on February 2nd—perhaps with a candle-making activity. I also encourage you to make a donation to your local food shelf, in the spirit of the Acadian Candlemas collections of long ago. 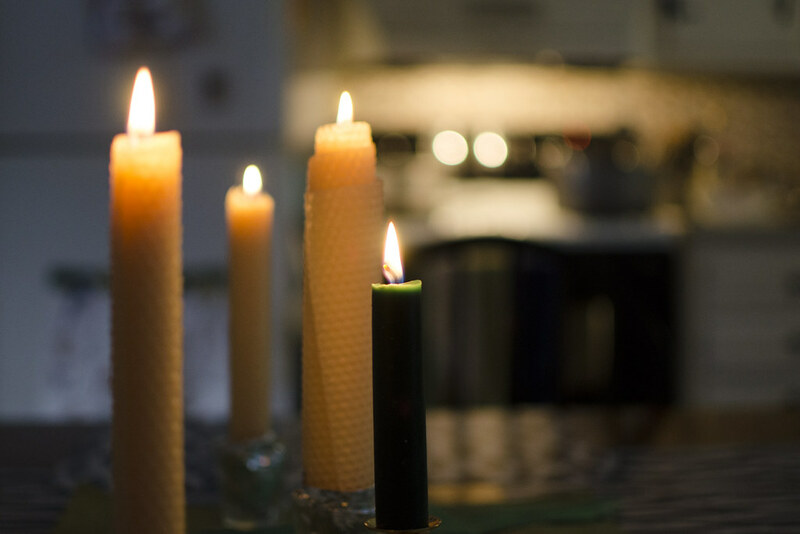 You might also enjoy this traditional Acadian recipe, traditionally eaten on Candlemas day. 1. Heat a griddle or large pan on medium heat. 2. Mix all the ingredients together to make a smooth dough (it will be very liquid, not fluffy like regular pancakes). 3. Grease the griddle or pan with butter. Drop tablespoons of batter onto the griddle and fry on medium heat until edges are cooked and bubbles form on top. 4. Flip over and fry until golden brown. Serve with molasses or grated maple sugar. The 6th of January is the Feast of the Epiphany of our Lord, also called Three Kings Day or Twelfth Night in some places. The word “epiphany” is derived from the Greek word Ἐπιφάνεια, (Epiphaneia), which means “manifestation.” The etymology of the word points to its origins in the Eastern Church, and it was historically a celebration of the manifestation of the Incarnation of Jesus Christ, varying locally in its observance of different events from Jesus’s childhood. The first mention of a celebration called Epiphany comes from the writing of the historian Ammianus Marcellinus, who noted in 361 A.D. that it was considered Christ’s Birthday. In the Western Church a particular focus on the visitation of the Magi, also known as the Three Kings or Wise Men, has developed over the years. 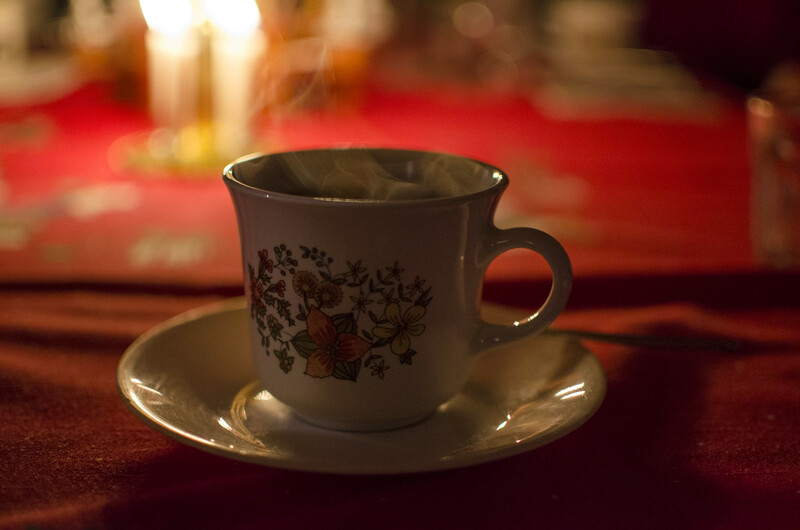 My mother-in-law is a retired high school French teacher, and has introduced many French traditions to our family. The French celebrated Epiphany with great fervor until the French Revolution, when anything religious or related to the monarchy fell out of favor or was outright banned. Despite no longer being a public holiday, many in France still celebrate Epiphany with the Gallete des Rois or Kings’ Cake. 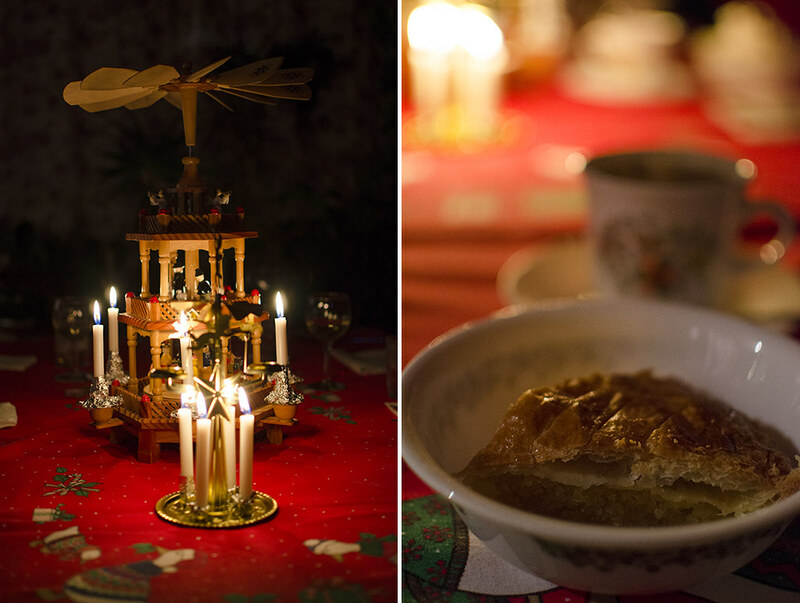 We always celebrate Epiphany with my in-laws. My mother-in-law cooks several dishes inspired by the flavors of the Middle East. We also have gingerbread cupcakes instead of a cake. For fun, my mother-in-law bakes a bean into one of them. Whoever finds the bean is crowned king or queen, and gets to wear the special tinfoil crown. It’s always a joy to be the one to discover the bean. The Kings also bring little gifts wrapped up in brown paper–often books–that are hidden throughout the house for the children to find. VIVE LE ROI – the one, true king, Jesus Christ! Recipes courtesy of my mother-in-law, Sharon Wilson. Pour boiling water over bulgur and salt. Cover and let sit for thirty minutes. Add olive oil and lemon juice, and refrigerate until chilled. Finally, add the onion, tomatoes, cucumber, and parsley just before serving. Serve over basmati rice and pita bread. Heat oven to 350 degrees. Line twelve 3.5-inch muffin pan cups with cupcake liners. Stir together flour, sugar, brown sugar, ginger, cinnamon, baking powder, cloves, and salt in a bowl. 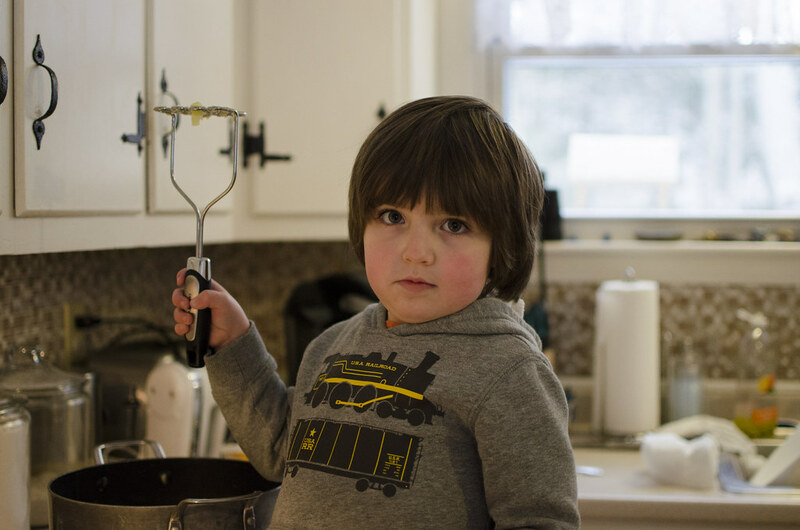 Whisk together molasses, applesauce, milk, oil, egg whites, and egg in another bowl. Fold in flour mixture until just moistened and spoon batter into muffin cups–don’t forget to put a bean into one of them! Bake for 20-25 minutes until a toothpick comes out clean. Cool completely. Saint Brigid’s Day takes place each year on February 1st. St. Brigid was born in Ireland about 450 A.D. She and her parents were baptized by St. Patrick, with whom Brigid maintained a close friendship. In her adult life she started many convents and became the first Abbess of Ireland. She also founded a school of art at which many famous illuminated manuscripts were created, including the Book of Kildare. 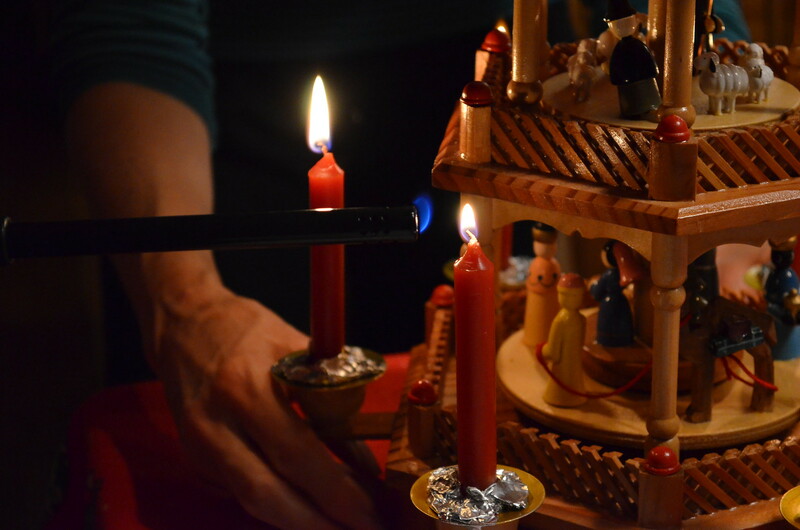 Many miracles are attributed to St. Brigid. 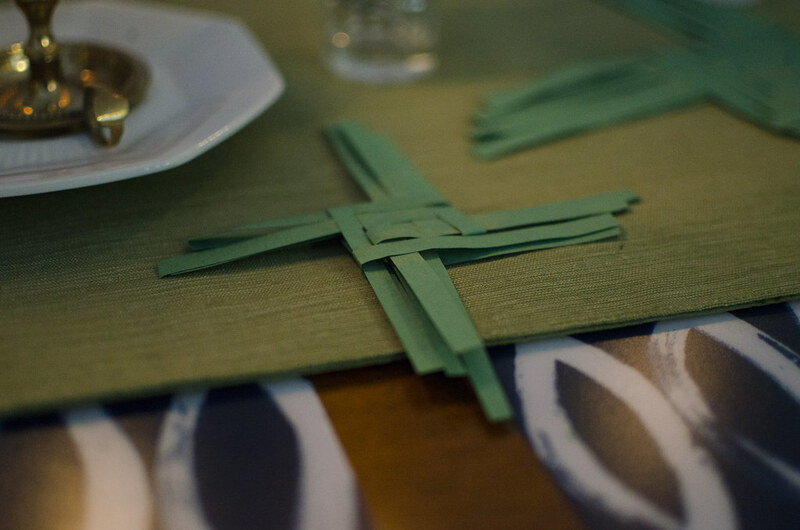 For our celebration we make St. Brigid’s Sweet Bannock, and sometimes we also make some St. Brigid’s Crosses. 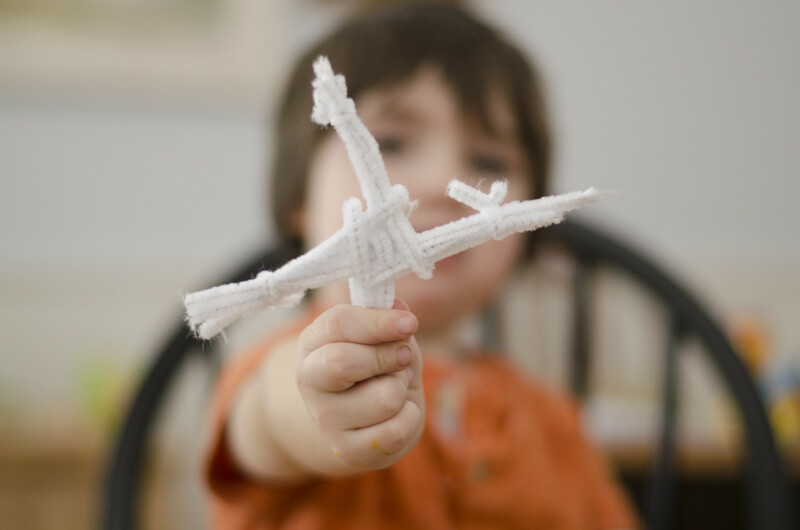 This is such an easy craft—even a three year old can do it! I used this tutorial. 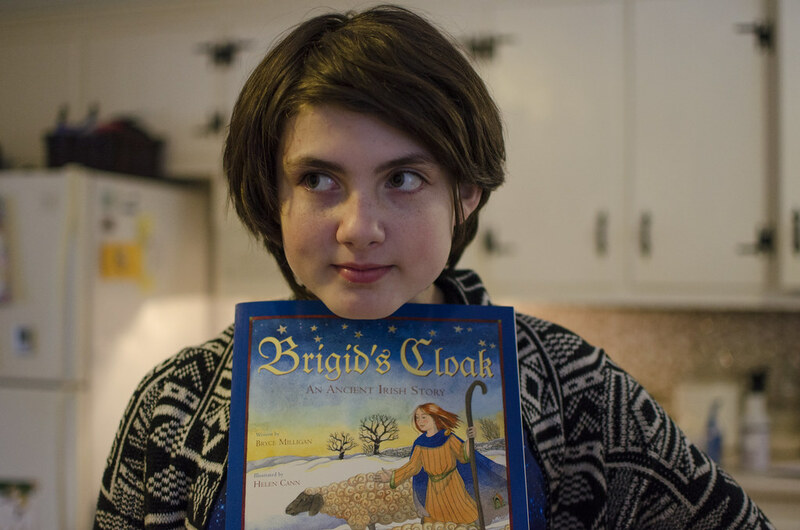 We also read a lovely book called Brigid’s Cloak, written by Bryce Milligan with watercolor pictures by Helen Cann. 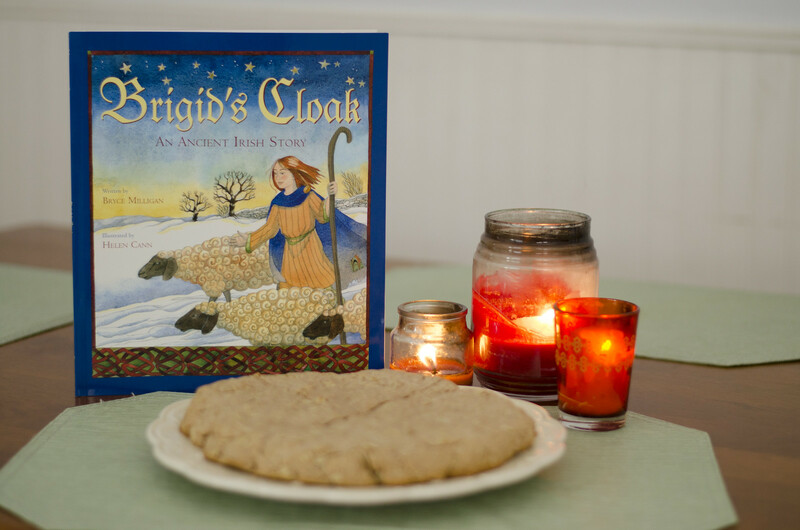 This beautifully illustrated book tells the story of Brigid’s overwhelming generosity toward those in need, and the origins of her miraculous cloak. 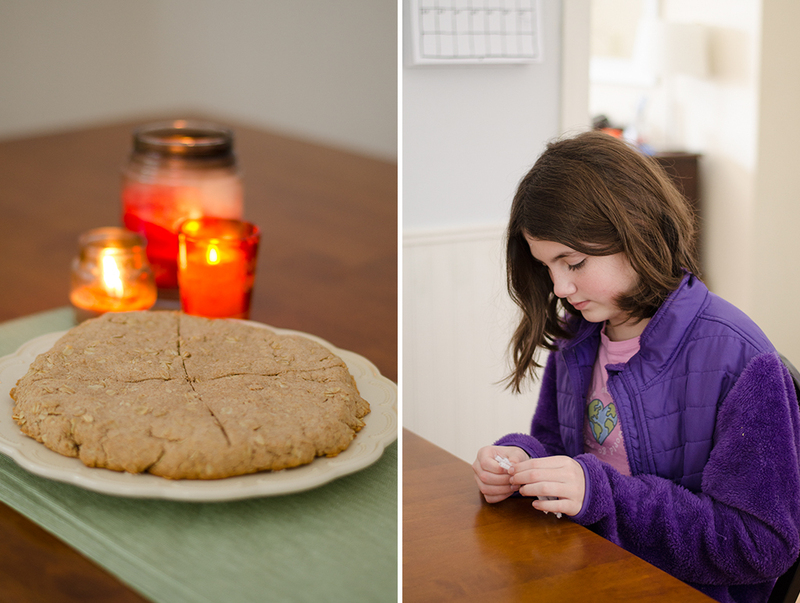 The bannock takes virtually no time to prepare, and the crosses are a nice afternoon craft for the kids. 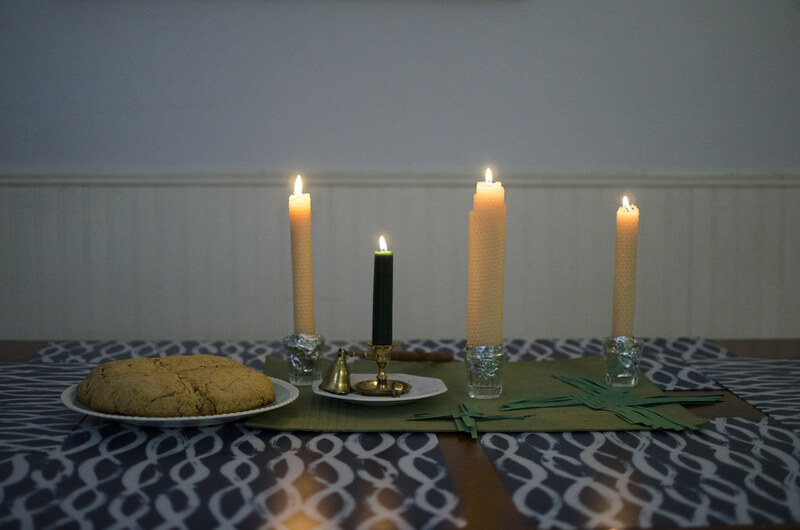 Feasts and festivals don’t have to involve an overwhelming amount of work—little celebrations can be just as meaningful as big ones. For more ideas and inspiration for celebrating St. Brigid’s Day, visit my Pinterest board! Celebrate Brigid with a tasty snack! 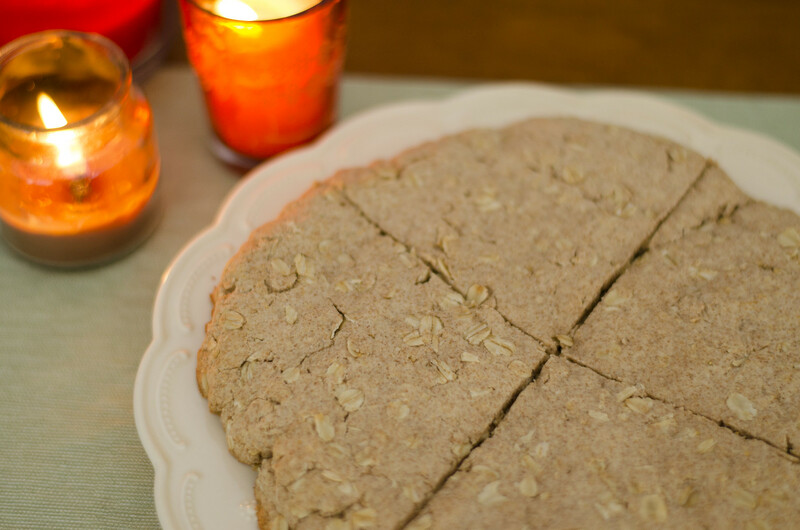 *Whole wheat flour makes a very dense bannock. **Buttermilk can be made using any cow’s milk of your choice and a tablespoon of lime juice, lemon juice, or vinegar per cup of buttermilk required. Add the juice or vinegar first, and then fill to the desired measuring line. 1. Preheat oven to 350° F. Cream butter and honey together. 2. Mix the dry ingredients together and stir into the butter-honey mixture. 3. Add buttermilk until a dough forms (I need a little over 1/4 cup). 4. Roll into a ball and flatten onto a greased cookie sheet; cut a cross into the top with a knife. 5. Bake 15-20 minutes, until golden brown. I know all the birds of the hills, and all that moves in the field is mine. When the days grow longer, the cold grows stronger . . . so says my father-in-law, quoting an old New England saying. The brutal chill of winter can be hard on us, but it is much harder on our feathered (and furry) friends that don’t have the comfort of a warm stove as temperatures drop. 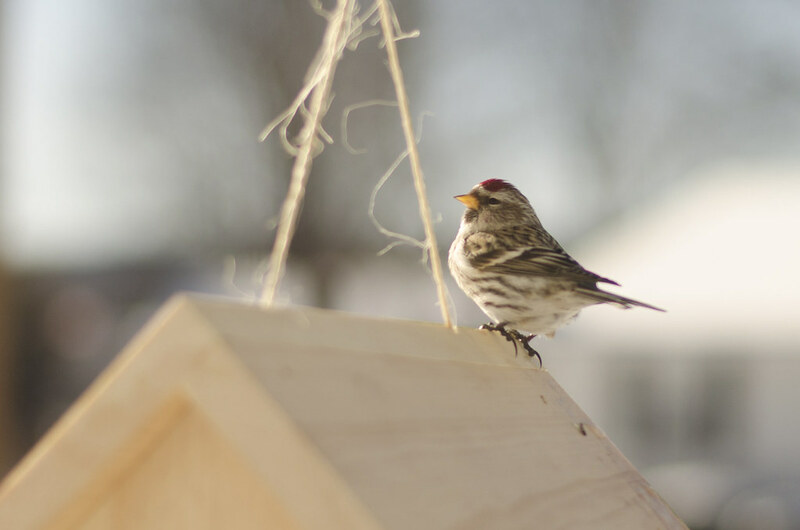 One way to help the wild birds and other creatures that live in or near your yard is to make sure they have enough to eat, which will help them to withstand the cold. It is fairly easy and inexpensive to build a simple bird feeder, and really only requires a little bit of diligence to keep the feeding areas free of snow, and make sure the feeders are re-stocked when the seeds are running low—my local “customers,” as we call them, go through a few cups of seeds per day. Images copyright (from left): Ilse Schmid; Jenny Nystrom; Rie Cranmer; Gerda Muller; Eloise Wilkin. I don’t know about you, but in the deep, dark days of winter I always wonder how those little creatures stay alive, especially here in New England where temperatures can get very, very cold. 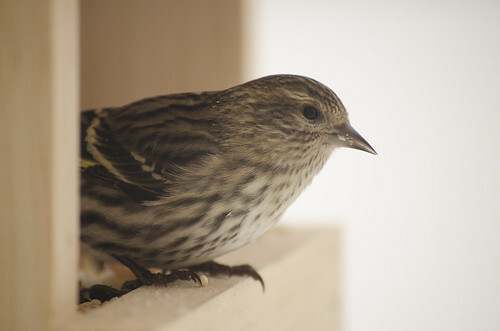 The answer involves a variety of factors: Birds have a higher metabolism than humans, and thus their bodies run at a higher temperature; many species grow special feathers that act as a sort of down blanket in the winter, holding heat close to their bodies; they fluff, tuck, and sun themselves, but they also spend a lot of time shivering. 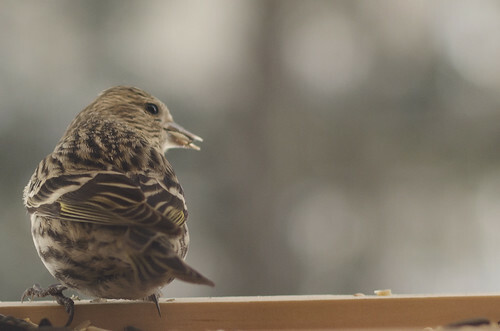 This last bit is one of the reasons why feeding birds is so important—if they don’t have enough food, they won’t have enough energy to do the things they need to do to keep themselves warm. Here is a friend who will welcome you all! 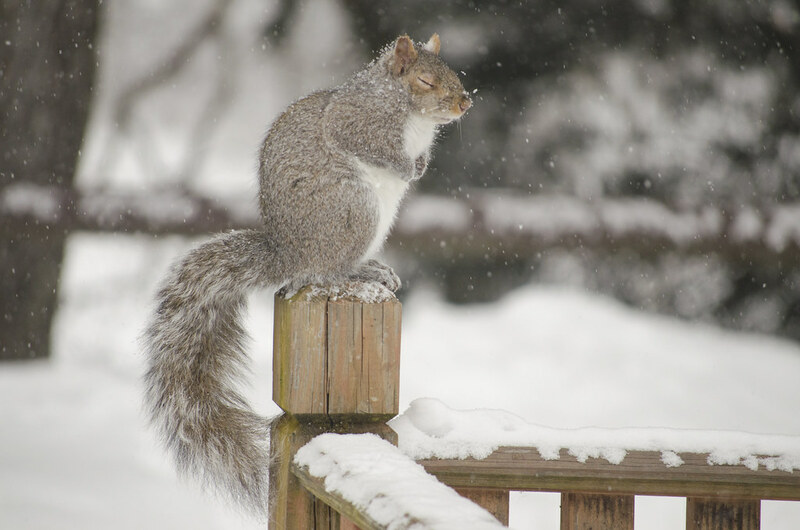 With us, alike, in the heat and the snow! There are lots of possibilities to explore in regards to feeding wild birds, but what we chose to do this year was to hang three very simple wooden birdfeeders (I used this pattern), one in the front of the house, and two in the back, as well as to shovel out a circular area in the backyard in which to scatter seeds, and the occasional peanut. 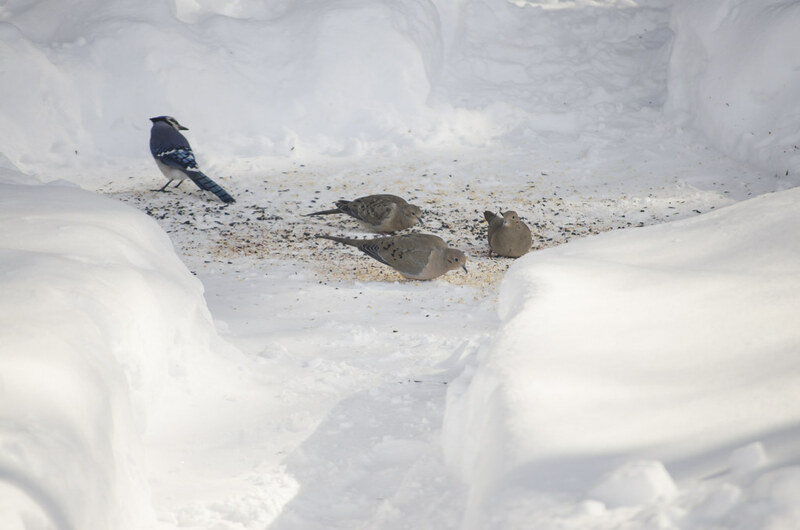 Blue jays love peanuts. 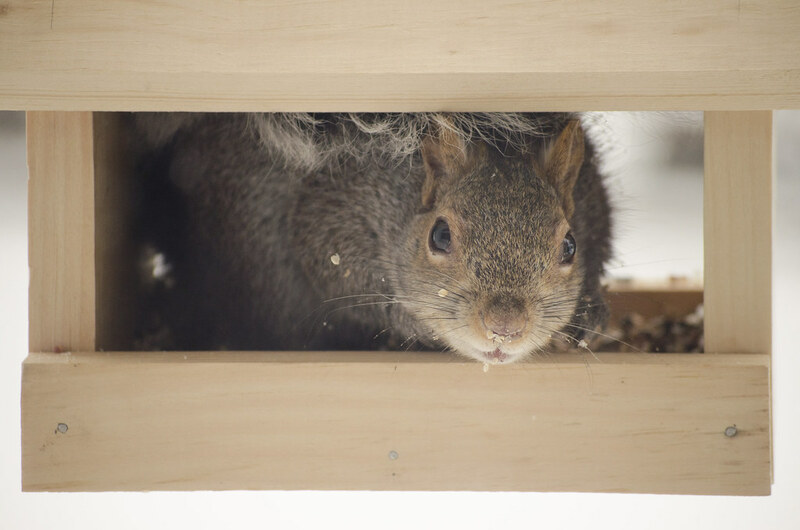 Of course, we have plenty of squirrels that come along with the birds, but I really don’t mind. I know they need to eat, too. 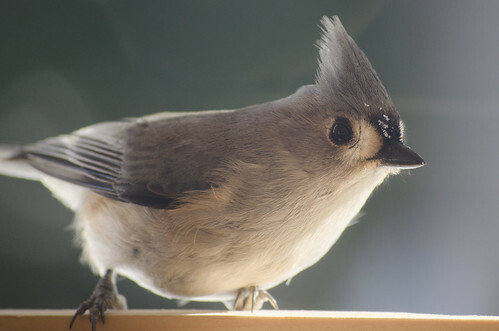 Because we hung one of our feeders right outside the window of our house, we are able to spend many happy hours watching the birds eat; we have a wonderful time trying to identify all of the different species. 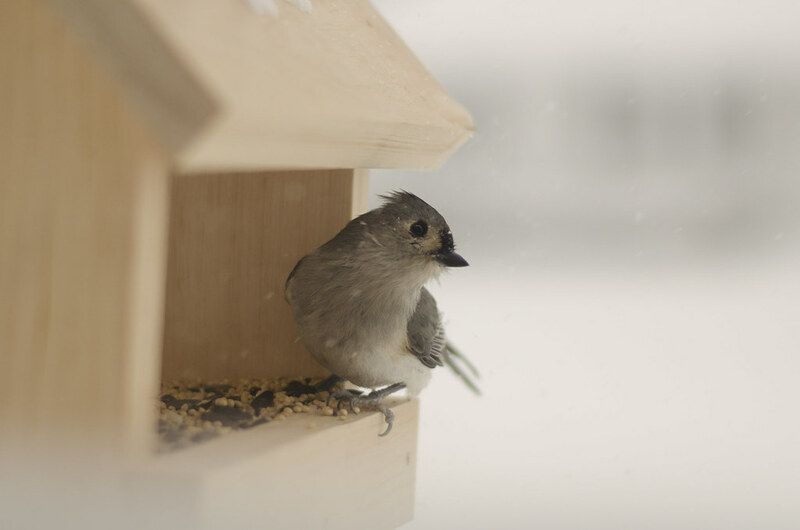 Having different types of feeding locations helps us to attract a wide variety, from mourning doves (who feed on the ground) to finches, nuthatches, and titmice (who like to eat from feeders). 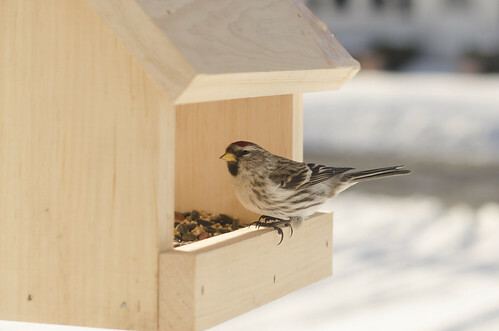 In the future, I would love to add a bird table for the species that want to be somewhere in between. Raw Peanuts: They inhibit protein absorption in birds and small mammals. 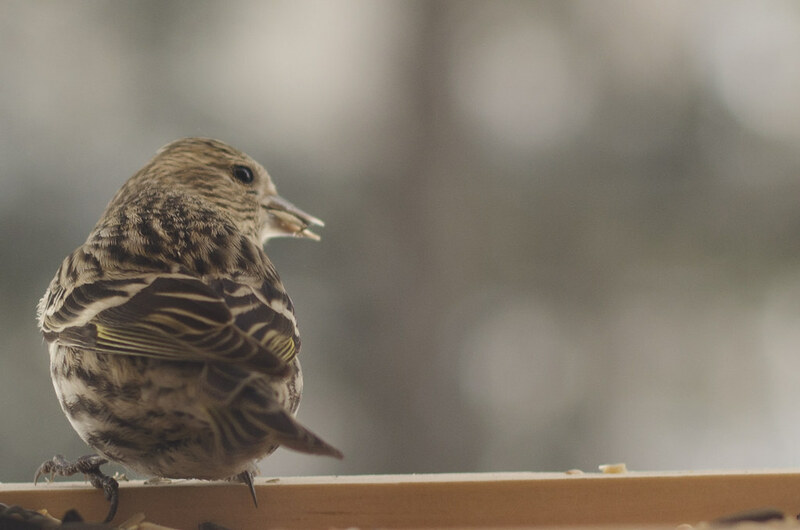 “People Food”: Items like bread and table scraps provide almost no nutritional value to birds, and moldy bread can make birds sick. 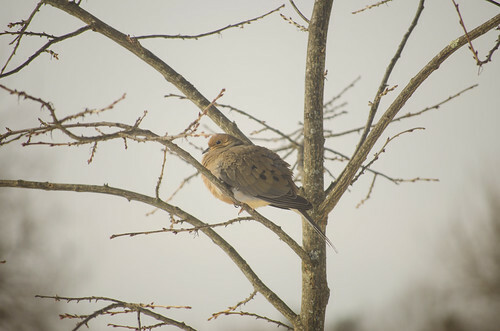 Here are some pictures I have taken of our feathered (and furry) friends.